Uploaded by Stanford Precourt Institute for Energy on 2018-12-02. It reminded us of an interesting discussion in Atlantic Power’s Q4 2017 conference call transcript (where they own a portfolio of power projects). We have been following the company for about a year, not least in part because of the thought-provoking tidbits such as the below (emphasis is ours). 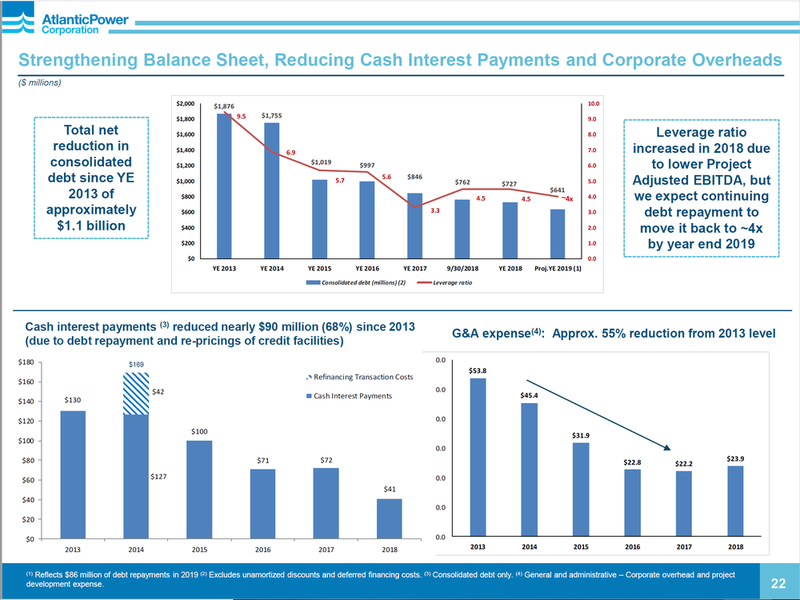 Since the new management team as come in, they have focused on (and talk about) improving cash flow (rather than “adjusted EBITDA”), reducing costs (successfully), deleveraging, and looking for counter-cyclical transactions. But more of a general question, so looking at the market for gas turbines today, it's a little bit soft. We've seen some plants come to the end of their contracts, that aren't renewed and there's a lot of talk about the potential for storage, plus renewables and lithium ion battery storage, in particular, in markets like California. So looking forward into the future, do you have a changing view on the competitiveness of natural gas turbines? And do you see a point where that storage and renewables will be cheaper than even legacy gas turbines? Let me walk on that a bit. It's -- I think the market seems to be focused on this renewable plus batteries. When we look at it, batteries are really not competitive on a wholesale economic basis yet. Even people like Bill Gates who's funding a green fund has said, he thinks the prices need to come down, the cost need to come down by a factor of 10x. We've talked to some of the academics storage people and they agree with that. Now having said that, in certain jurisdictions, if you want to do batteries since battery storage you can do it. And you can subsidize it or you can mandate it on to the grid, but I think it's an economic proposition. You're taking high-cost intermittent power, and you're adding high-cost storage to that. It doesn't seem very economic, absent tax subsidies and government mandates, RPS', et cetera. Now so I think our gas fleet, the way I think about it is, it's a little bit of an option on somebody's faulty plans on storage not panning out as well as people think. Maybe battery costs not coming down as fast as people think they're going to come down. And I first looked at batteries in the '90s with natural power back in the United Kingdom. And I've evolved. And since then, batteries in certain circumstances make a lot of sense. It's really application-specific, too. So marine usage are better than kind of wholesale electric power uses. But on the gas side, the gas is flexible and so it is equivalent of a battery and to the extent that the public policy continues to push intermittent sources onto the grid, those sources decline in value as the penetration percentage goes up. So if you look at somebody's levelized cost of energy studies, I know Lazard puts out one, if you look at the top, there's a bullet that says, the cost of intermittent -- didn't see you're not included in this analysis. So really, you have to look at, not just the cost of the hour of the powers forming but the value of the power, too. So example, in Texas, when the wind is all on, I think they're up to maybe 50% wind depth, at certain hours. All that power is coming on in those same hours and it's not coming on across the demand curve. So the irony, there's a self-limiting factor on putting intermittent sources onto a grid and you have to look at not only the levelized cost of the energy, but you have to look at the whole grid cost and you have to look at the value of the power and the hours it's coming on. My own take, speaking for myself, not even for the company, is that the public policy is very myopic at this point and very superficial and not taking into consideration our cost, broadly. I think, now speaking for the company again, over time, as -- if batteries aren't falling in costs, out of kind of a Moore's law basis, and if we don't get new technologies like Gates is talking about, then the value of gas is going to go back up in places where there's high levels of integration into the grid. Now the other flip side of that kind of moving off of storage and renewables is, commodity businesses are inherently cyclical. You intend to make your money in the power business at least our thirty year experience has been -- they're not necessarily great buy-and-hold investments, but you make more money by being countercyclical and if your curating your investing, and you'll have long periods of time when the assets in the sectors aren't earning their cost to capital, and people will continue to pile new supply into the grid, even though the grid is already oversupplied and that will lead to low prices. And if you look at prices today, for gas turbines, power prices are not remunerating new gas plants by and large. Now you can pick a brand-new gas CCGT with a low heat rate and stick it into a grid and make an assumption about power curves coming up and that might work for you, but in terms of what the wholesale prices are -- generally, we're so far below replacement costs. It's not funny, but we don't know if that model is broken or not because we're heavily government-regulated, and who knows how much more intermittent sources you're going to pour into some grid. I think, when you're going from 0% to 10%, like we did in Texas, when we first started investing in wind plants in 2001, I think it's pretty easy to do that and then if you go beyond that, you start to create problems for the grid and you start to have pushback from locals, on NIMBY-type issues. You have pushback from consumers, on pricing. And frankly, it's going on a little bit longer than I thought it would in this cycle. And so we're really not good at predicting when cycles are going to change, but we just try to make sure our balance sheet is pretty robust at the bottom of the cycle and we're not investing in new plants, and then when there's a crack-up, we have plenty of liquidity in balance sheet and we're ready to move when things are cheap. So for example, in 2015, we sold our wind fleet for what I thought was about 14x normalized cash flow doing my own cash-flow analysis. And then the yieldco buyer started to break apart and you had some bankruptcies and prices start to come down and I thought if we could buy those assets back at 7x, we should buy it back and -- but we really haven't had a market like that since '15. And so we'll just have to be patient and play things out. So that's a longer answer to your question, but I think it's important for our investors to kind of have that strategic background that I don't know that we did so much in our remarks.